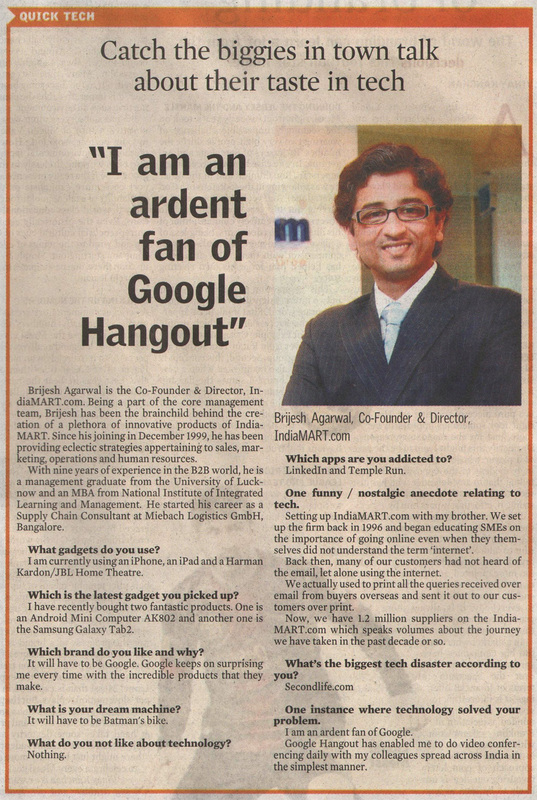 Brijesh Agarwal is the Co-Founder and Director, IndiaMART.com. Being a part of the core management team, Brijesh has been the brainchild behind the creation of a plethora of innovative products of IndiaMART. Since his joining in December 1999, he has been providing eclectic strategies appertaining to sales, marketing, operations and human resources. I am currently using an iPhone, an iPad and a Harman Kardon/JBL Home Theatre. Which is the latest gadget you picked up? I have recently bought two fantastic products. One is an ANdroid Mini Computer AK802 and another one is the Samsung Galaxy Tab 2. Which brand do you like and why? It will have to be Google. Google keeps on surprising me every time with the incredible products that they make. What is your dream machine? It will have to be Batman’s bike. What do you not like about technology? Which apps are you addicted to? One funny/nostalgic anecdote relating to tech. Setting up IndiaMART.com with my brother. We set up the firm back in 1996 and began educating SMEs on the importance of going online even when they themselves did not understand the term ‘internet’. Back then many of our customers had not heard of the email from buyers overseas and sent it out to our customers over print. Now we have 1.2 million suppliers on the IndiaMART.com which speaks volumes about the journey we have taken in the past decade or so. What’s the biggest tech disaster according to you? One instance where technology solved your problem. I am an ardent fan of Google. Google Hangout has enabled me to video conferencing daily with my colleagues spread across India in the simplest manner.